Children are a veritable wealth of knowledge. Kid 1: Did you know that years ago, that angry tennis man John McEnroe flipped the bird at the queen? Kid 1: Yes, and the Queen flipped the bird back at him. Me: Now I know that part didn’t happen. Kid 1: It did, it did. The Queen flipped the bird. And so it went, did, didn’t, did, didn’t. It turns out he had seen an advertisement for a television ‘mockumentary’ on tennis and at the time, believed it to be a true historical fact. I for one, imagine that during her illustrious reign, Her Royal Highness must have wanted to flip the bird at least once. (Gesticulating in this manner has certainly crossed my mind once or twice when arguing with Kid 1). This spot of baking hails from the iconic British baker, Delia Smith. This no-nonsense doyenne of English cookery is accredited for teaching two generations of loyal British fans how to cook. Her recipes are reliable and are also easily converted into gluten free options. In her cookbook Delia’s Cakes, she tells us that this cake was ‘originally from the sugar-and-spice island of Jamaica.’ Darkly treacly, spicy, sticky and chewy. This is almost like a real loaf of bread. It is truly better when wrapped and left for a day and even better (like so many things), when smeared with butter. Now I just know that Delia would never flip anyone the bird. Getting Ready: Preheat the oven to 170C and line a standard loaf tin with baking paper. Delia suggests using a ready made loaf tin liner (which I did not have.) 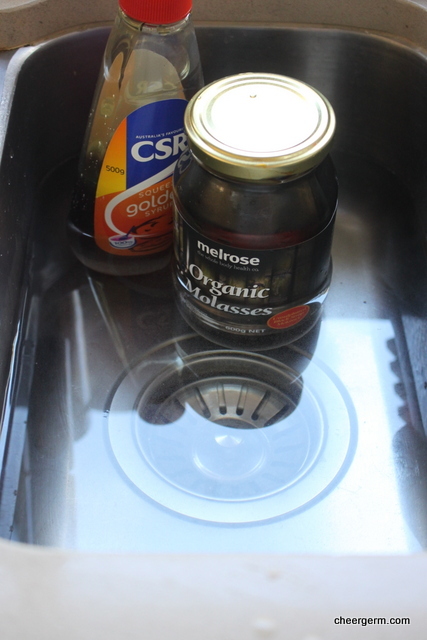 Place the tin of treacle or molasses and golden syrup bottle in hot water to warm them and make it easier to measure them. Sift the flours and spices into a large bowl. 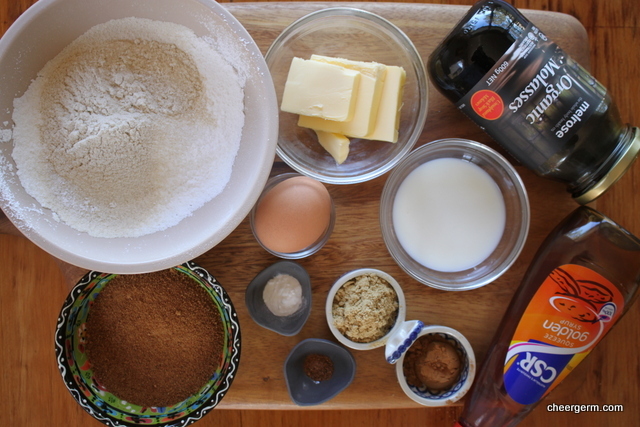 Mix the bicarbonate of soda into the milk and set it to one side. 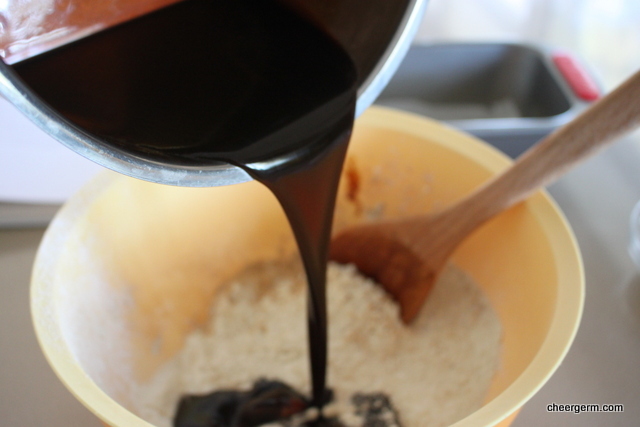 Measure the treacle/molasses, golden syrup, sugar and butter into a saucepan with 75ml of water. Heat over a low heat and stir gently until thoroughly melted and blended. Don’t let it come anywhere near the boil and don’t go off and leave it. Next add the syrup mixture to the flour and spices, beating vigorously with a wooden spoon. When the mixture is smooth, beat the egg in a little at a time, followed by the bicarbonate of soda and milk. Now pour the mixture into the prepared tin and bake on a lower shelf, align the the tin with the centre of the oven for 50 minutes to 1 hour until it’s well-risen and firm to the touch. 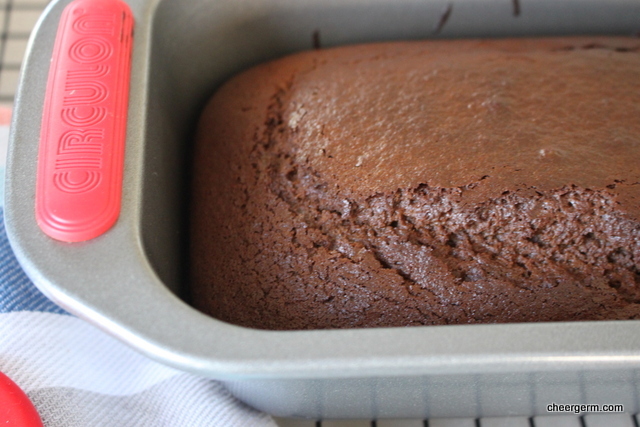 Remove the cake from the oven and allow it to cool in the tin for 5 minutes before turning out. 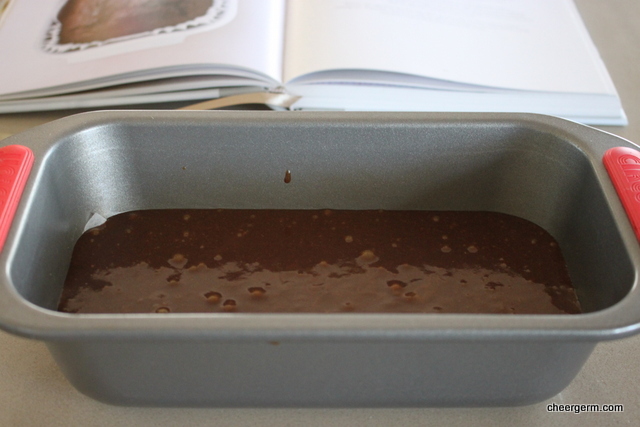 If possible, store it in a cake tin in the liner (if you used one) or wrapped in clingfilm for 24 hours before eating. It is delicious smeared with butter. This entry was posted in Gluten free baking and desserts and tagged baking, cheergerm, Cooking, Delia Smith, food, ginger, gluten free, gluten free gingerbread, Humour, molasses, treacle. Bookmark the permalink. You have me salivating Cheery!! My English Granny used to make a recipe very similar to this. I haven’t made it since giving up the gluten, some how I didn’t think it would translate, but I love it, deliciously moist still after a week and yes definitely, smeared with butter!! Time to tell Kis 1 you can’t belive everything to see or read in the media! 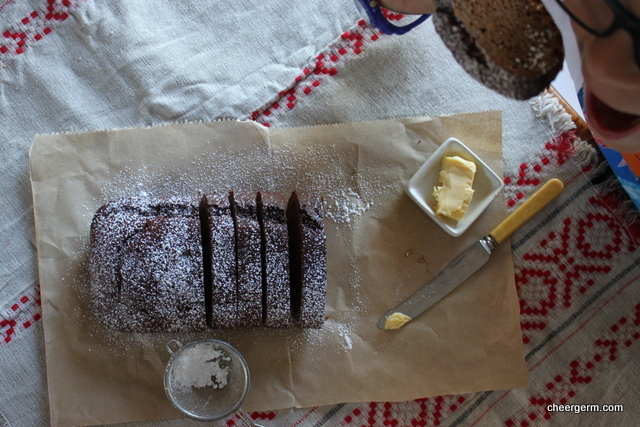 A perfect winter bread for tea. I remember reading “Alice” and wondering what treacle was, then finally looking it up. And in one of my stories, my alter ego Laura reports that she drank an entire can of golden syrup (Lyle’s) and didn’t get sick 🙂 The byproducts of sugar refinement seem to hold a dark fascination for me, which means that I must make this bread!! As always I envy your family, getting to scarf down all these luscious treats. Yes, to me it sounds veddy veddy English! 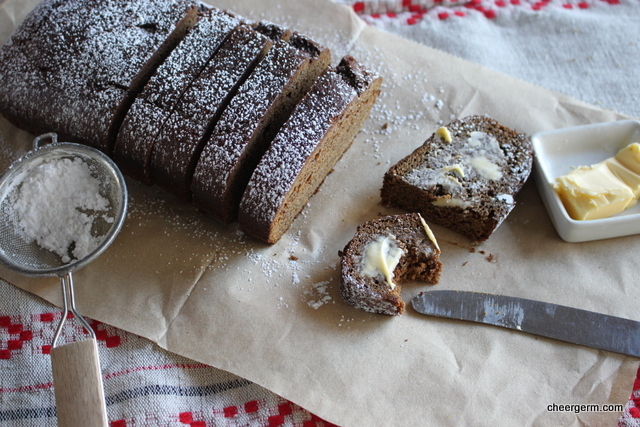 Hmmm…haven’t had Jamaican ginger cake for a long time! This I am going to have to try! I am in love with Delia Smith–and mostly the pictures of her recipes. Drool-worthy, indeed. I’m tucking this recipe away for one month from now. The first of September always ushers in the transitioning to autumn and I do think this gingerbread should be celebrated appropriately. So, Delia may never have flipped anyone the bird, but she’d certainly flip over your bread! I like to think that she would approve of this rendition of her recipe and not be tempted to flip me the bird instead. Save it for your gorgous autumnal days. Hopefully you get a bit more summer first Mrs P.
Thanks for your lovely comments Peachy and for stopping by. Your curry looked tantalising indeed! 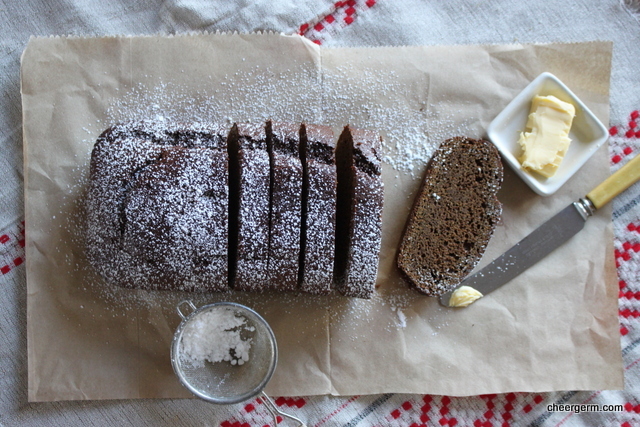 Lovely dark winter cake, You know, I had have heard that expression before- ‘flipped the bird’! Love it. Quite the tasty treat and beautiful pictures to compliment it too! Heehee – your sense of humor, I really f*ckin adore it. Thanks KW. Yes, M Berry is pretty great as well. I do remember some controversy regarding a speech made by Delia at a football game so you have a very good point there. Now, about her Majesty at polo…?? Sure thing Ms J. Book me a flight….will there be Guiness and leprechauns? Thanks Kabuto! 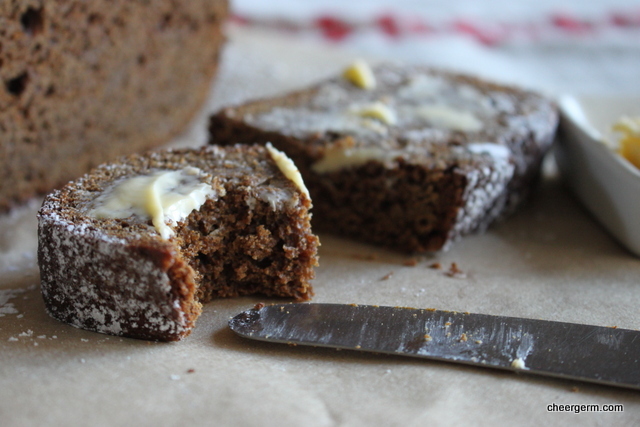 One of my favourite cakes before I stopped eating gluten was a Jamaica ginger cake; this gluten free gingerbread cake is very similar in taste and texture with the bonus of small pieces of chopped .